Sourdough is the perfect bread. Crusty with complex flavours and a chewy crumb, artisan bakers command high prices for the perfect loaf of sourdough bread. And well they should. The process is time consuming, though not complicated. I love the chewy texture and tart taste of warm sourdough French bread slathered in garlic butter. It’s the perfect accompaniment to cheesy onion soup, or spaghetti with mizithra cheese and spicy meat sauce. And the good news is, you don’t have to go to a fancy restaurant to get real, sourdough French bread. You can make sourdough bread at home. Once a good sourdough starter is obtained and maintained, the process is relatively simple, requiring just flour and water to keep it going. Like making cheese, pickles, sauerkraut, and kombucha, sourdough bread relies on lactobacillus bacteria for its taste, and health benefits. While you can get your sourdough starter from a neighbor or order one online, you can also make your own with just two ingredients. There are lots of intriguing recipes for creating your own sourdough starter out of thin air. These claim to capture “wild” yeasts. However, the best sourdough starter relies on the natural micro-organisms already found on whole grains. Don’t use bleached flours to make sourdough starters. Bleached flours are sterilized, chlorinated or bromated, precisely to get rid of these naturally occurring micro-organisms and extend shelf life. For best results use organic. 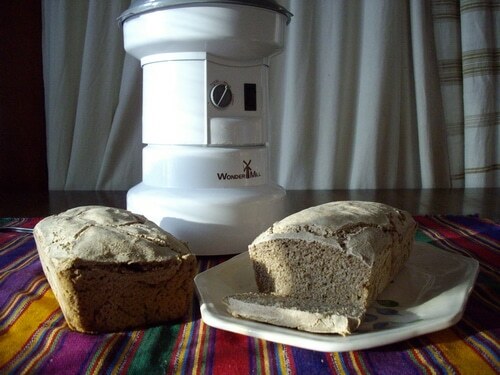 unbleached whole grain flours, or even better mill the grain yourself as you need it and use the whole grain. This is the grain mill that I use. Why grow your own sourdough starter? A good sourdough starter can last for years or even decades if you take good care of it. 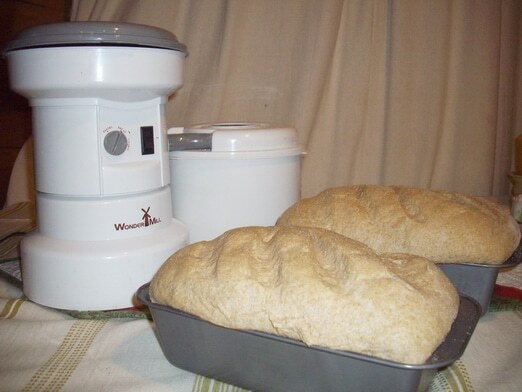 You can grow your own sourdough starter without the need to catch “wild yeast”. Sourdough improves the taste and texture of home baked bread. Sourdough bread, because of its longer fermentation times, is healthier and tastier than conventional breads. True sourdough bread flavour and texture can’t be found in commercially baked bread, where time is money. Instead, you have to capture it at home, or buy from an artisan bakery. Use the freshest rye flour that you can find. The freshest flour will contain more of the beneficial lacto-bacillus bacteria on the grain, and fewer spoilage micro-organisms. If you are milling it yourself, use organic whole rye berries to make your sourdough starter. You’ll need about 2 to 3 lbs to get a thriving sourdough starter if you are starting from nothing. 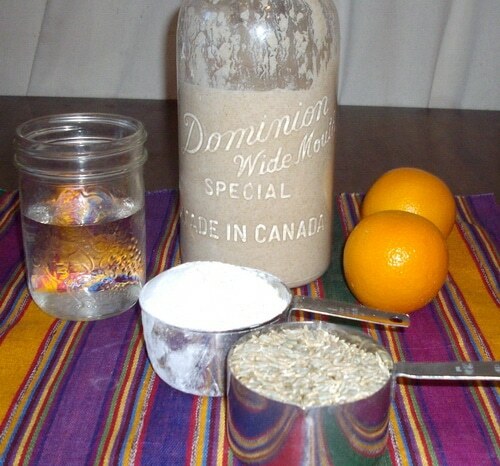 Day 1: Mix ½ cup of rye flour with ½ cup of water in a glass jar. Mix well and cover with a loose lid. Day 2: Add ½ cup of rye flour and ½ cup of water. Mix well. By now you should see some bubbles start to form. Day 3: By now your mixture should be bubbly and beginning to rise in the jar. If not, repeat Day 2. If it is active and has started to rise, remove ½ of the starter, and throw it away. Replace with ½ cup of rye flour and ½ cup of water. By tossing out some of your starter and adding fresh flour and water, you reduce the alcohol bacteria and give the yeast a chance to strengthen in the starter. The lactic acid bacteria need more time to reproduce than the yeast bacteria, so by tossing out some of the starter, you remove some of the yeast and give the lactic acid a better chance to populate your starter. Day 4: By now your culture should be active and able to double or triple in volume in a 24 hour period. At this point, again remove ½ your starter and toss it out. Replace with ½ cup of rye flour and ½ cup of water. Day 5: Your starter should double or triple in volume after each fresh addition. If it doesn’t repeat day 4 until it does. Once it is reliably active you can let your starter rest on the counter for a few days. Day 6 – 8: Your starter is resting and developing a fruity smell. Your starter is ready to bake bread when it doubles in volume within 8 hours. Keep your sourdough starter in the fridge and take it out the night before baking day. This allows the sourdough starter to come to room temperature. Remove half the starter from the jar and replace with ½ cup of rye flour and ½ cup of water. Only feed your starter with rye flour and water. Never add anything else to your starter. Leave it at room temperature for a few hours until it begins to bubble. Then you can put it back in the fridge until you need it again. The starter that you removed becomes the starter for your sourdough recipe. If your starter develops off smells or mould toss it and start again with sterilized equipment and freshly milled rye flour. If your sourdough starter becomes inactive, activate it again by removing half of the starter and replacing with ½ cup of rye flour and ½ cup of water. Continue to do this until the starter doubles in volume within 8 hours. 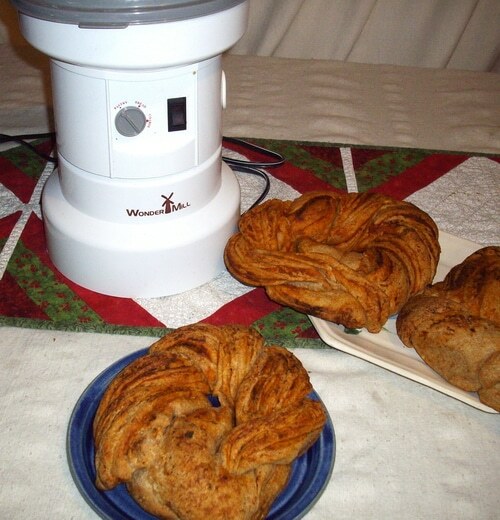 Your starter needs to be fed with fresh rye flour and water at least once every 7 to 10 days. The Day Before: The day before you plan to bake bread, remove the starter from the fridge. Let it come to room temperature. Feed your starter with 1 cup of rye flour and 1 cup of water. Mix well. Allow it to double in volume. This takes 6 to 8 hours. Feed your starter again with an additional 1 cup of rye flour and 1 cup of water, mixed in well. Allow it to double in volume. Before you make your bread, remove 1 cup of starter and put it in a clean, sanitized jar, cover and put it back in your fridge. You should have 2 cups of sour dough starter to bake bread with. Add to this 2 cups of wheat flour and 1 cup of water to make a sponge. Allow to double in volume. And then proceed with your recipe. This sourdough starter recipe makes a liquid starter about the viscosity of pancake batter. Keep your homebaked sourdough bread fresher with a linen bread bag. You can sew one with beginner sewing skills, and a thrift store linen napkin. See my tutorial on the Attainable Sustainable blog here. Now bake a loaf of sourdough bread. Add a jar of this sourdough starter. And a handwritten recipe and you’ve got a gift fit for your BFF, for a hostess gift, or for your DIL, that costs under $5. Learn more about baking handmade sourdough bread from Craftsy: Handmade Sourdough: From Starter to Baked Loaf, with Richard Miscovich. I am currently enrolled in this class. It’s amazing. I’m learning so much I didn’t know, even though I’ve been baking bread for more than 30 years. If you want to master sourdough baking, you’ll really benefit from this online class. I’m trying to make starter again. I’m on day number 4 and so far things are going well this time. However, today was the first day that there was a 1/4 inch layer of yellowish, (good smelling – unlike last time), clearish liquid on the top. The Man says this is the yeast multiplying. At this point I’m supposed to be taking 1/2 cup of it out and replacing it with 1/2 flour and water. Do I pour off the yellow liquid as part of the removing 1/2 cup, or do I stir it in and *then* measure the 1/2 cup to remove? Much thanks for your guidance! Love the recipes and info about this, but it would be nice it it was more concise so i COULD PRINT JUST THE RECIPE not all the pictures etc. Hi, D. I’m glad you like the recipe for sourdough starter. Thanks for your suggestion about making a print friendly version for folks like you who’d like to print out my posts. I just added a print-friendly button at the bottom of each of my posts for your convenience. Just click on the button and you can click a box to remove the pictures, save a pdf copy or print it directly from the post with or without pictures. I hope this helps. I made it to Day 4 and everything was going great. On day Five, I became a little confused. When I checked the jar, there was a layer of what appeared to be fuzz on top. I’m not sure what happened. Am I supposed to stir it that top layer in? Do I add another 1/2 cup rye and water again? It was all bubbly underneath but only rose about half way. I stirred it and Day 6 hasn’t risen more than half way again and has that ewy layer on top again. Did I do something wrong? If it’s fuzzy and not bubbly it could be mold. Dump it and start again with a sterilized jar. You definitely don’t want to use it if it’s moldy. Are you dumping half the mixture and refreshing the jar with flour and water or are you just adding to the mix each time? The dumping gets rid of some of the yeast and allows the lactobacteria to proliferate. It’s the lactobacteria that gives the preservation of the sourdough and prevent mold from forming. Rye is not gluten free, so how can this starter be used to make a gluten free bread? Lisa, just last week I made up a starter from just freshly ground hard winter wheat berries and filtered water. I’m happy to report that the starter brewed just fine with only wheat berries and no rye. I followed these directions but I didn’t like the idea of wasting so much flour, so here’s what I did instead. I used only 2 tbsp of wheat flour and 2 tbsp of water. After 24 hours I dumped 1/2 of the batter, and added 1 tbsp of wheat flour and 1 tbsp. of water. I did this every day for 5 days. The sour dough starter responded exactly the same way as the rye starter with one little difference. The starter smelled like apples rather than sour dough. After 5 days I mixed 1 cup of flour with one cup of water, and added the full amount of sour dough starter to it. I left it overnight. It bubbled up. In the morning (day 6), I reserved 2 tbsp. of this dough for sourdough starter. With the rest, I mixed a light dough for bread baking, leaving the dough a little on the moist side. It rose perfectly. The resulting bread tasted like sourdough, and not too sour. So now I can definitely recommend using just wheat instead of rye, if you don’t have rye flour on hand.